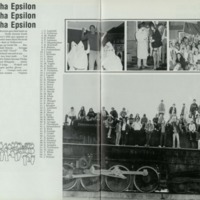 The Web 1980 "Sigma Alpha Epsilon"
The image in the top left of the Sigma Alpha Epsilon photo collage shows fraternity members dressed as Ku Klux Klan members standing around a black man with his neck in a noose at the fraternity lodge. The photo of fraternity members in the top right also features a student in blackface, and another in a faux American Indian headdress and face paint. Virginia Baptist Historical Society, The Web (1980): 194. Available online via the UR Scholarship Repository. “The Web 1980 "Sigma Alpha Epsilon",” Race & Racism at the University of Richmond, accessed April 18, 2019, https://memory.richmond.edu/items/show/2764.